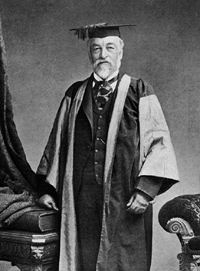 Samuel Pierpont Langley (1834 - 1906) is often used as a contrast to the Wrights. Unlike the two brothers, Langley was highly-educated and had more than ample funding in support of his efforts to develop an airplane. His stature at Secretary of the Smithsonian Institution lent great credibility to his efforts to build an airplane, as did his success with the unmanned aerodromes. In particular, his Aerodrome No. 6 flew 4,200 feet at about 30 mph on November 28, 1896. 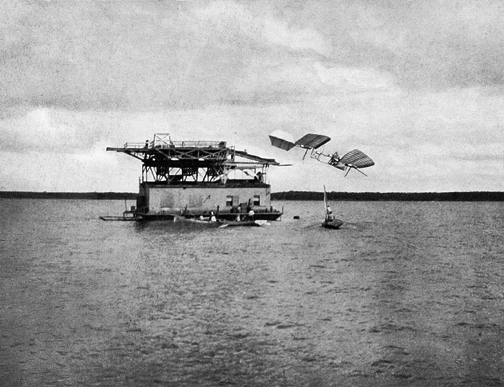 This unmanned tandem-wing craft employed a lightweight steam engine for propulsion. The wings were set at a distinct dihedral angle so that the craft was dynamically stable, capable of righting itself when disturbed by a sideways breeze. There was no method of steering this craft, nor would it have been easy to add any means to control the direction the craft flew. From the success of No. 6, Langley was able to convince the War Department (a.k.a. Department of Defense) to contribute $50,000 toward the development of a person-carrying machine. The Smithsonian contributed a like sum towards Langley's efforts. Charles Manley developed an extraordinary radial-cylinder internal combustion engine that developed 52 horsepower for the man-carrying Great Aerodrome. Langley felt it would be safest to fly over water, so he spent almost half of his funds constructing a houseboat with a catapult that would be capable of launching his new craft. The Great Aerodrome might have flown if Langley had chosen a more traditional means of launching the craft from the ground. The pilot still would have lacked any means of steering the plane, and so faced dangers aplenty. But it might have at least gotten into the air. Unfortunately, Langley chose to stick with his 'tried-and-true' approach of catapult launches. The plane had to go from a dead stop to the 60 m.p.h. flying speed in only 70 feet. The stress of the catapult launch was far greater than the flimsy wood-and-fabric airplane could stand. The front wing was badly damaged in the first launch of October 7, 1903. A reporter who witnessed the event claimed it flew "like a handful of mortar." Things went even worse during the second launch of December 9, 1903, where the rear wing and tail completely collapsed during launch. Charles Manley nearly drowned before he could be rescued from the wreckage and the ice-covered Potomac river. Needless to say, the Washington critics had a field day. The Brooklyn Eagle quoted Representative Hitchcock as saying, "You tell Langley for me ... that the only thing he ever made fly was Government money." Representative Robinson characterized Langley as "a professor ... wandering in his dreams of flight ... who was given to building ... castles in the air." The War Department, in its final report on the Langley project, concluded "we are still far from the ultimate goal, and it would seem as if years of constant work and study by experts, together with the expenditure of thousands of dollars, would still be necessary before we can hope to produce an apparatus of practical utility on these lines." Eight days after Langley's spectacular failure, a sturdy, well-designed craft, costing about $1000, struggled into the air in Kitty Hawk, defining for all time the moment when humankind mastered the skies. In spite of 18 years of well-funded and concerted effort by Langley to achieve immortality, his singular contribution to the invention of the airplane was the pair of 30-lb aerodromes that flew in 1986. He died in 1906 after a series of strokes, a broken and disappointed man.